At MTI we are as keen as anyone to ensure that all customers, when in the process of buying a car, experience great service, professional advice crystal clear communication, honest hard working sales and service staff and obviously a great deal on whatever car they purchase. In fact our mission statement requires that we “bridge the gap between the motor trade and the consumer”. We also passionately believe that – for the longevity of the industry as a whole and the many thousands of businesses and people working in the trade – in order for them to survive they must remain profitable. If a dealer or service centre decides to neglect their customers and provide shoddy service and be inflexible when negotiating a fair deal, they surely deserve to suffer accordingly. However there are many professionals from all aspects of the trade who are extremely hard working and customer focused and we believe the industry as a whole has worked tremendously hard to improve its image and integrity over the past few years. With the investment injected by manufacturers and dealers alike, with better facilities and sumptuous surroundings – which customers spending large sums of money should expect and enjoy – the quality of the product has just got better and better and there are great strides being made to train and coach staff to be more professional when helping customers decide what their next car should be. The auctions used to be a place where Joe Public would get eaten alive if he took the risk of trying to buy where the trade buy. Now, however the major auctions have made it so much easier for customers to confidently buy a car through their outlets, they describe the cars better and provide help and advice to all customers and the improved facilities encourage them to tell their friends. 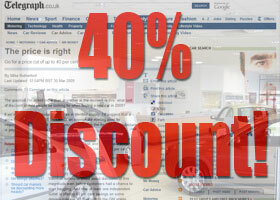 The independent dealers have also made every effort to improve everything they do, with big investments in web sites and showroom enhancements. The extra products offered today are evidence of an industry which is trying to adapt and improve whilst at the same time ensure that they remain profitable. Of course there are, as in any business sector, bad apples; you only need look at the banks and the houses of parliament to see evidence of a whole greengrocer’s shop of bad apples and people who put self interest, profit and appalling customer service way before the people they are supposed to serve. But that doesn’t mean that there are not some really good businesses and people who try and make a positive difference every day. So when we read articles like the one by Mike Rutherford in the Telegraph yesterday (“The price is right -Go for a price cut of up to 40 per cent or walk away”) we’re sure it will frustrate the hell out of any company in the business of selling cars. Mike Rutherford, of course, doesn’t work in the trade, he is a motoring journalist and just reports on motoring issues as he sees them and we are in a recession and the car industry is a well documented victim of this, but by encouraging buyers to go into dealers and ask for 40 to 50% discounts on cars, is that really going to be the way to ensure that the business survives? Does Mike Rutherford care one way or the other as long as he’s got things to write about? If car makers and their dealers are as desperate to do a deal as this article suggests then they must be in worse shape than we all thought and we’re not sure we would like to buy a car not knowing whether the people who sold it to us will still be in business in a few months time. The point is that in all our cumulative years in the business we have seen good and bad customers and some good and bad dealers and the best deals which have been negotiated, both for the dealer and the customer, are where the sales person has taken care of his customer and spent the correct amount of time with them, phoned them back when they promised to, achieved a price which everyone is happy with and still spoke to that customer once they had driven off in their new car. Those customers then come back for their servicing and tell their friends and family how good the dealer is and do you know what? We think most people who received this kind of service and, perhaps more importantly, aftersales service would be fairly happy for the dealer to earn a profit and a salesperson to earn his commission. With customers trying to wipe thousands off the car’s price would that necessarily encourage great service when these cars must be being sold at a loss? We don’t think so and for the future of a healthy industry its maybe time we stopped this obsession with rock bottom price and looked more at the overall package. Is it really worth travelling miles away for a few hundred pounds more discount when a customer cannot conceivably carry on a reasonable aftersales relationship with that dealer? What they really need is a continuing feeling of knowing they paid a fair price but expecting a first class service for that profit, and if that does not continue to be the case dealers will only have themselves to blame! PSA Peugeot Citroen sack their boss tooPorsche hits the jackpot!